Gardening in Africa: Incredibly appealing! 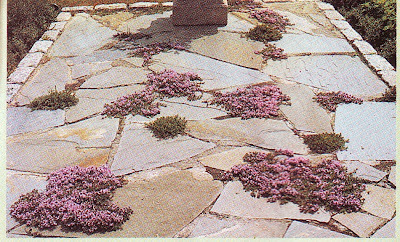 I've always found herb-strewn stone paths and terraces incredibly appealing. Herbs tucked amid the stones seem to give a path, no matter how new, a sense of history and romance. There are several plants that thrive in these restricted spaces, ignoring the trauma of being trod upon, and when the Slasto path was being laid, I asked the gardener to leave s space here and there where I could tuck in some creeping thyme. I bought several different varieties at the local nursery, dug them in the small pockets that had been left, watered them well and waited. 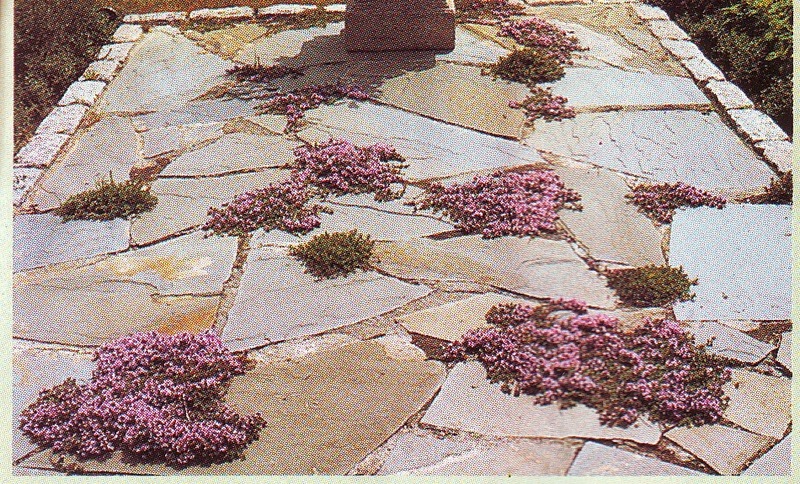 Before long, the path had lost its harsh, just-finished look, and tiny purple and white flowers covered the little clumps of thyme that grew here and there, releasing their fresh fragrance whenever anyone walked by. Soon other plants joined the thyme. A few springs of mint escaped from the culinary garden, chamomile seeded itself here and there and even savory, yarrow and fennel popped up between the cracks. I pulled out most of the trespassers, with the exception of the chamomile with its tiny white flowers. 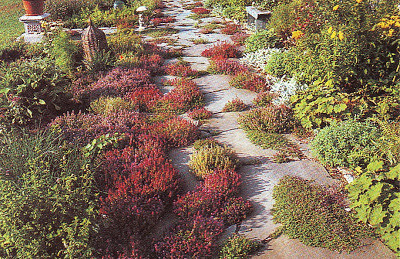 Eventually, the thyme threatened to cover the entire path, so several times a year I must harden my heart and ruthlessly lift great mats of it off the stones and cut them back. For a day or two, the plants look ungainly, but shortly they begin to spread out again, the edges of the patches softening once more. Through it all, the bees continue to buzz joyously among the thyme flowers, relishing this herbal path as much as I do. A new stepping stone path taking shape leading to the cottage at the bottom of the garden planted with Nasturtiums, Rosemary and Wild Garlic. This area was surprisingly free of harmful insects, probably due to the Wild Garlic planted at intervals. 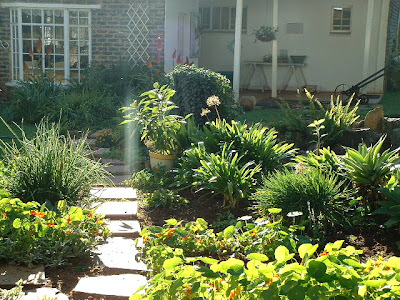 I find that any spot that's doing poorly in the garden, especially shady spots under trees, benefit from laying a couple of paving slabs or adding some crushed stone and with a garden ornament or two, can be turned into a really stunning area. Thank you very much Garten, greetings to you too!